If you plan to take a lump sum from your company's defined benefit pension plan and roll it into an IRA instead of scheduling periodic payments for the rest of your life, make sure you know the rollover rules from the Internal Revenue Service. A misstep could cost you unnecessary tax liabilities or force you to follow extra procedures to protect the retirement assets you've earned. You can roll over only a lump sum payment. Monthly or other periodic lifetime pension payments typically end with your death or, depending on your plan's options, with your spouse's death. There are no rollover possibilities for periodic payments, and you cannot count them as earned income to qualify for deductible IRA contributions. By choosing the lump sum, your pension may become part of your estate. Rolling over a lump sum payment into a self-directed traditional IRA allows flexibility in investment selection and governing your income stream, plus you'll gain tax-deferred compounding. However, you'll also add investment risk. A lump sum pension payment will be taxed as ordinary income the year it's paid unless you roll it over into a traditional IRA or another qualified retirement plan. Even if you opt for an IRA rollover, 20 percent of your payout may be withheld unless you opt for a direct rollover rather than taking the money yourself for redeposit into your IRA. The easiest direct rollover involves a straight asset transfer, beginning with a request from your new tax-qualified plan custodian after you've opened the account. If your pension plan offers only a distribution check given to you, a direct rollover remains possible. To accomplish the direct transfer, you must specify that the check be written to your new custodian FBO – for the benefit of – your name. You complete the rollover by turning the check over to your plan custodian. Can I Open a Roth IRA If I Am Not Working? When a lump sum distribution check is written directly to you, the payer must withhold 20 percent to cover any potential tax liability. To avoid actually paying any tax liabilities, you have 60 days to deposit the sum in a qualified IRA or another employer's plan. You can roll over a sum equal to the amount paid to you plus the withholding, but you must get funds equal to the amount withheld within 60 days from another source to add to the distribution you received. You'll be able to recover the withheld money when you file your tax return. If you don't replace the withheld amount in your rollover, it will be treated as income for your distribution year. If you're not yet 59 1/2, the withheld portion also will be considered an early distribution subject to a 10 percent tax penalty. You also can roll over a pension lump sum to a Roth IRA. The rollover will be treated as taxable income in the year of the transaction, but subsequent Roth distributions will be tax-free, and you won't have to take any required minimum distributions after you reach 70 1/2 as you would with a traditional IRA. To avoid an early withdrawal penalty on your Roth rollover, you must complete the transaction within 60 days. In addition, funds rolled into a Roth in this way must stay within the account for at least five years or until you turn 59 1/2 before you can withdraw them penalty-free. If you roll over your pension lump sum to a traditional IRA, you can later convert all or a portion of it to a Roth IRA that is eligible for tax-free growth and distributions. Any conversion will be subject to the same IRS rules as a conversion from a traditional IRA you established with regular contributions. Depending on your income eligibility, you can make deductible contributions to a rollover IRA. 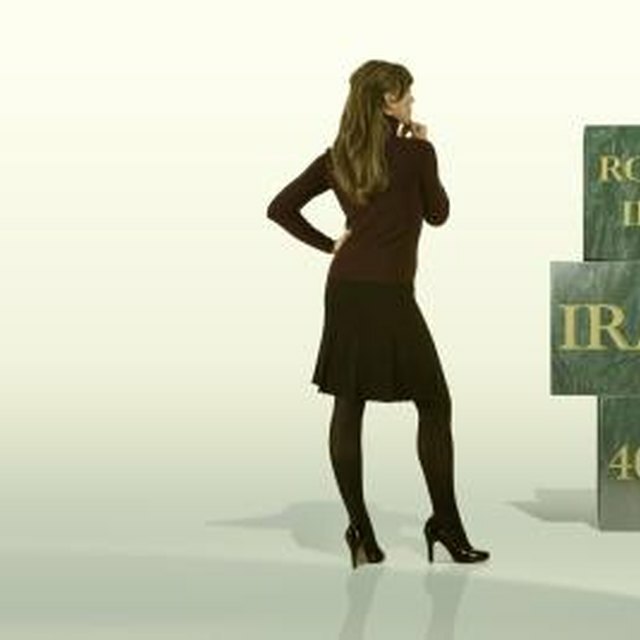 But if you do – or if you move the lump sum into an existing IRA – the transaction loses rollover status, which means you can't roll it back into a 401(k) or similar retirement plan at a subsequent job. Moving your rollover IRA into an employer-sponsored plan can protect your assets. The Employee Retirement Income Security Act of 1974 put workplace retirement plans off-limits to creditors and damage judgments. In some states, traditional IRAs are not protected from damage claims or creditors. To maintain your workplace rollover option, make IRA contributions after the rollover to a separate IRA.